External dosimetry audits give confidence in the safe and accurate delivery of radiotherapy. In the United Kingdom, such audits have been performed for almost 30 years. From the start, they included clinically relevant conditions, as well as reference machine output. Recently, national audits have tested new or complex techniques, but these methods are then used in regional audits by a peer-to-peer approach. 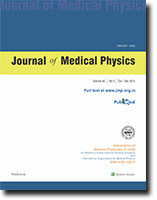 This local approach builds up the radiotherapy community, facilitates communication, and brings synergy to medical physics. 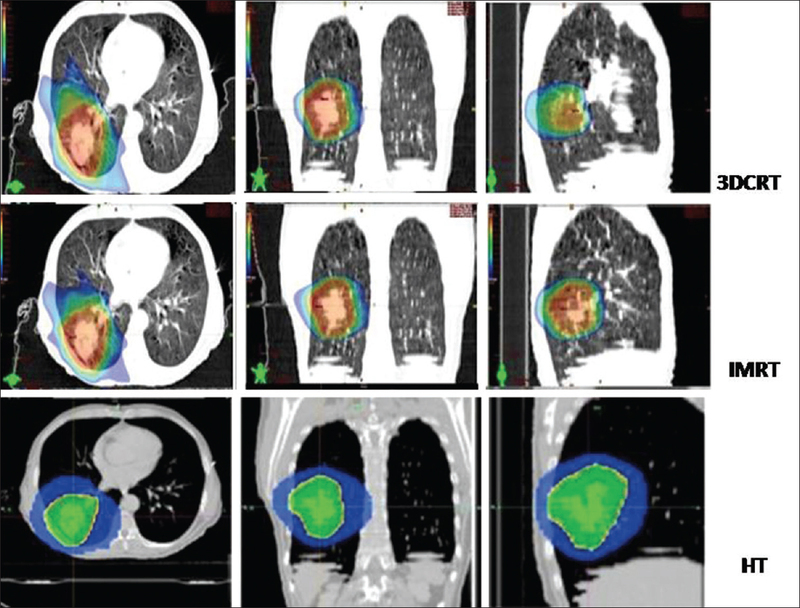 To compare the treatment plans generated with three-dimensional conformal radiation therapy (3DCRT), intensity modulated radiotherapy (IMRT), and helical tomotherapy (HT) for stereotactic body radiotherapy of lung, twenty patients with medically inoperable (early nonsmall cell lung cancer) were retrospectively reviewed for dosimetric evaluation of treatment delivery techniques (3DCRT, IMRT, and HT). A dose of 6 Gy per fraction in 8 fractions was prescribed to deliver 95% of the prescription dose to 95% volume of planning target volume (PTV). Plan quality was assessed using conformity index (CI) and homogeneity index (HI). Doses to critical organs were assessed. Mean CI with 3DCRT, IMRT, and HT was 1.19 (standard deviation [SD] 0.13), 1.18 (SD 0.11), and 1.08 (SD 0.04), respectively. Mean HI with 3DCRT, IMRT, and HT was 1.14 (SD 0.05), 1.08 (SD 0.02), and 1.07 (SD 0.04), respectively. Mean R50% values for 3DCRT, IMRT, and HT was 8.5 (SD 0.35), 7.04 (SD 0.45), and 5.43 (SD 0.29), respectively. D2cmwas found superior with IMRT and HT. Significant sparing of critical organs can be achieved with highly conformal techniques (IMRT and HT) without compromising the PTV conformity and homogeneity. 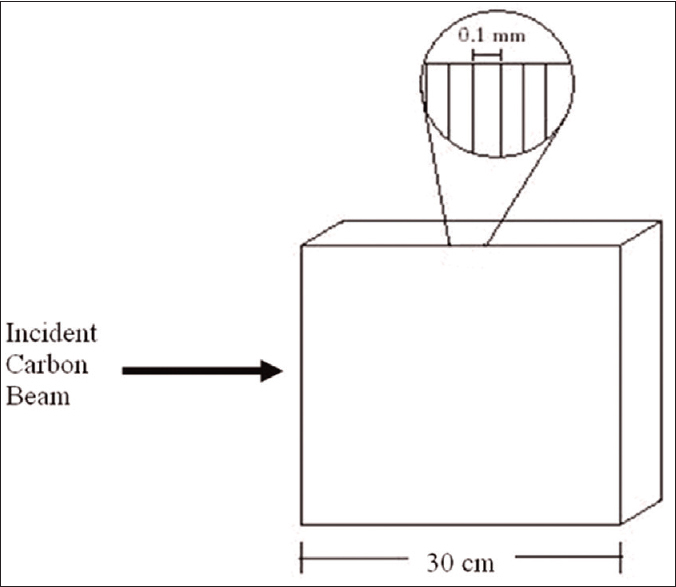 This study was undertaken to evaluate the effect of external metal filters on the image quality of computed tomography (CT) and single photon emission computed tomography (SPECT)/CT images. 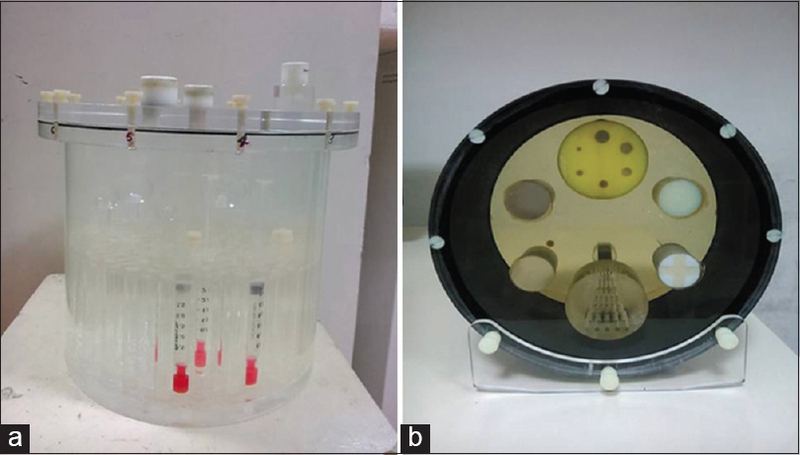 Images of Jaszack phantom filled with water and containing iodine contrast filled syringes were acquired using CT (120 kV, 2.5 mA) component of SPECT/CT system, ensuring fixation of filter on X-ray collimator. Different thickness of filters of Al and Cu (1 mm, 2 mm, 3 mm, and 4 mm) and filter combinations Cu 1 mm, Cu 2 mm, Cu 3 mm each in combination with Al (1 mm, 2 mm, 3 mm, and 4 mm), respectively, were used. All image sets were visually analyzed for streak artifacts and contrast to noise ratio (CNR) was derived. Similar acquisition was done using Philips CT quality control (QC) phantom and CNR were calculated for its lexan, perspex, and teflon inserts. Attenuation corrected SPECT/CT images of Jaszack phantom filled with 444–555 MBq (12–15 mCi) of 99mTc were obtained by applying attenuation correction map generated by hardened X-ray beam for different filter combination, on SPECT data. Uniformity, root mean square (rms) and contrast were calculated in all image sets. Less streak artifacts at iodine water interface were observed in images acquired using external filters as compared to those without a filter. CNR for syringes, spheres, and inserts of Philips CT QC phantom was almost similar to Al 2 mm, Al 3 mm, and without the use of filters. CNR decreased with increasing copper thickness and other filter combinations. Uniformity and rms were lower, and value of contrast was higher for SPECT/CT images when CT was acquired with Al 2 mm and 3 mm filter than for images acquired without a filter. The study suggests that for Infinia Hawkeye 4, SPECT/CT system, Al 2 mm, and 3 mm are the optimum filters for improving image quality of SPECT/CT images of Jaszack or Philips CT QC phantom keeping other parameters of CT constant. The main purpose of this study is to know the effect of three different photon energies viz., 6, 10, and 15 mega voltage (MV) on RapidArc (RA) planning for deep-seated cervix tumor and to develop clinically acceptable RA plans with suitable photon energy. RA plans were generated for 6, 10, and 15 MV photon energies for twenty patients reported with cervix carcinoma. 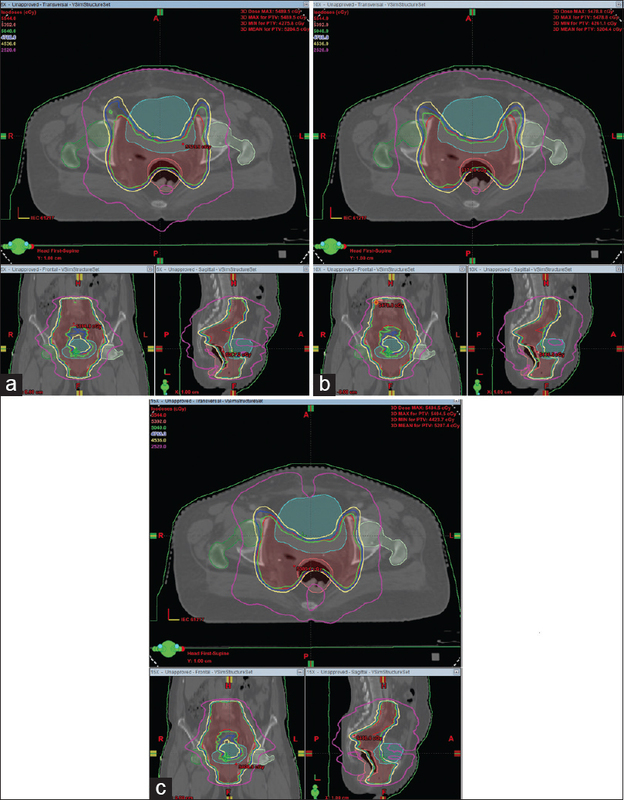 RA plans were evaluated in terms of planning target volume (PTV) coverage, dose to organs at risk (OARs), conformity index (CI), homogeneity index (HI), gradient measure, external volume index of dose distribution produced, total number of monitor units (MUs), nontumor integral dose (ID), and low dose volume of normal tissue. A two-sample paired t-test was performed to compare the dosimetric parameters of RA plans. Irrespective of photon energy used for RA planning, plans were dosimetrically similar in terms of PTV coverage, OARs sparing, CI and HI. The numbers of MUs were 13.4 ± 1.4% and 18.2 ± 1.5% higher and IDs were 2.7 ± 0.8% and 3.7 ± 0.9% higher in 6 MV plans in comparison to that in the 10 and 15 MV plans, respectively. V1Gy, V2Gy, V3Gy, and V4Gywere higher in 6 MV plans in comparison to that in 10 and 15 MV plans. Based on this study, 6 MV photon beam is a good choice for RA planning in case of cervix carcinoma, as it does not deliver additional exposure to patients caused by photoneutrons produced in high energy beams. The factors influencing carbon ion therapy can be predicted from accurate knowledge about the production of secondary particles from the interaction of carbon ions in water/tissue-like materials, and subsequently the interaction of the secondary particles in the same materials. The secondary particles may have linear energy transfer (LET) values that potentially increase the relative biological effectiveness of the beam. Our primary objective in this study was to classify and quantify the secondary particles produced, their dose averaged LETs, and their dose contributions in the absorbing material. A 1 mm diameter carbon ion pencil beam with energies per nucleon of 155, 262, and 369 MeV was used in a geometry and tracking 4 Monte Carlo simulation to interact in a 27 L water phantom containing 3000 rectangular detector voxels. The dose-averaged LET and the dose contributions of primary and secondary particles were calculated from the simulation. The results of the simulations show that the secondary particles that contributed a major dose component had LETs <100 keV/µm. The secondary particles with LETs >600 keV/µm contributed only <0.3% of the dose. A national survey was conducted to obtain information about the use of image-guided radiotherapy (IGRT) techniques and IGRT dose measurement methods being followed at Indian radiotherapy centers. A questionnaire containing parameters relevant to use of IGRT was prepared to collect the information pertaining to (i) availability and type of IGRT delivery system, (ii) frequency of image acquisition protocol and utilization of these images for different purpose, and (iii) imaging dose measurement. The questionnaire was circulated to 75 hospitals in the country having IGRT facility, and responses of 51 centers were received. Su rvey results showed that among surveyed hospitals, 86% centers have IGRT facility, 78% centers have kilo voltage three-dimensional volumetric imaging. 75% of hospitals in our study do not perform computed tomography dose index measurements and 89% of centers do not perform patient dose measurements. Moreover, only 29% physicists believe IGRT dose is additional radiation burden to patient. This study has brought into focus the need to design a national protocol for IGRT dose measurement and development of indigenous tools to perform IGRT dose measurements. The aim of this study was to examine the impact of dose rate on accuracy of intensity modulated radiation therapy (IMRT) plan delivery by comparing the gamma agreement between the calculated and measured portal doses by pretreatment quality assurance (QA) using electronic portal imaging device dosimetry and creating a workflow for the pretreatment IMRT QA at hospital levels. As the improvement in gamma agreement leads to increase in the quality of IMRT treatment delivery, gamma evaluation was carried out for the calculated and the measured portal images for the criteria of 3% dose difference and 3 mm distance-to-agreement (DTA). 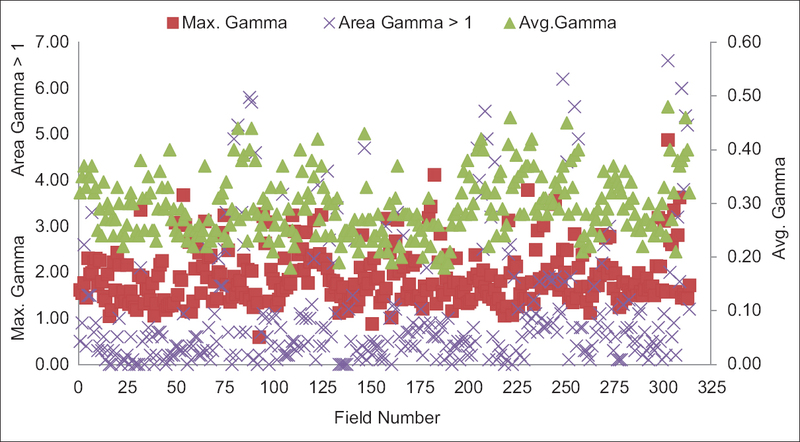 Three gamma parameters: Maximum gamma, average gamma, and percentage of the field area with a gamma value>1 .0 were analyzed. Three gamma index parameters were evaluated for 40 IMRT plans (315 IMRT fields) which were calculated for 400 monitor units (MU)/min dose rate and maximum multileaf collimator (MLC) speed of 2.5 cm/s. Gamma parameters for all 315 fields are within acceptable limits set at our center. Further, to improve the gamma results, we set an action level for this study using the mean and standard deviation (SD) values from the 315 fields studied. Forty out of 315 IMRT fields showed low gamma agreement (gamma parameters>2 SD as per action level of the study). The parameters were recalculated and reanalyzed for the dose rates of 300, 400 and 500 MU/min. Lowering the dose rate helped in getting an enhanced gamma agreement between the calculated and measured portal doses of complicated fields. This may be attributed to the less complex motion of MLC over time and the MU of the field/segment. An IMRT QA work flow was prepared which will help in improving the quality of IMRT delivery. 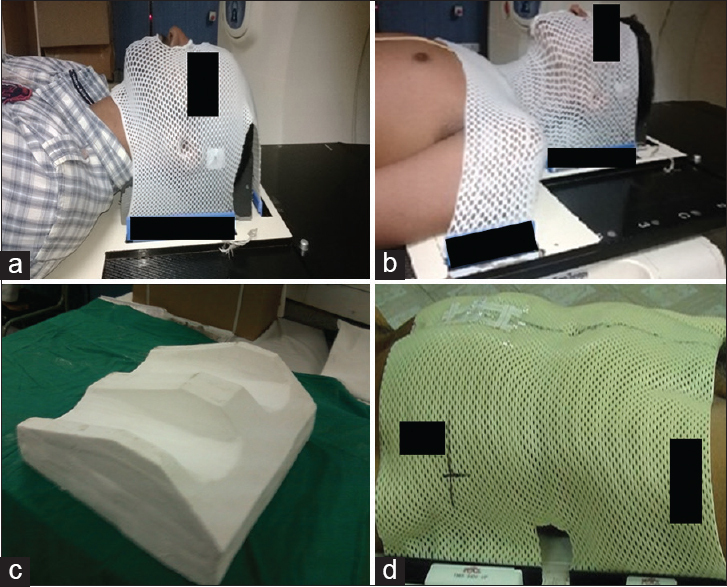 The adequacy of setup margins for various sites in patients treated with helical tomotherapy was investigated. A total of 102 patients were investigated. The breakdown of the patients were as follows: Twenty-five patients each in brain, head and neck (H and N), and pelvis, while 12 patients in lung and 15 in craniospinal irradiation (CSI). Patients were immobilized on the institutional protocol. Altogether 2686 megavoltage computed tomography images were analyzed with 672, 747, 622, 333, and 312 fractions, respectively, from brain, H and N, pelvis, lung, and CSI. Overall systematic and random errors were calculated in three translational and three rotational directions. Setup margins were evaluated using van Herk formula. The calculated margins were compared with the margins in the clinical use for various directions and sites. We found that the clinical isotropic margin of 3 mm was adequate for brain patients. However, in the longitudinal direction it was found to be out of margin by 0.7 mm. In H and N, the calculated margins were well within the isotropic margin of 5 mm which is in clinical use. In pelvis, the calculated margin was within the limits, 8.3 mm versus 10 mm only in longitudinal direction, however, in vertical and lateral directions the calculated margins were out of clinical margins 11 mm versus 10 mm, and 8.7 mm versus 7.0, mm respectively. In lung, all the calculated margins were well within the margins used clinically. In CSI, the variation was found in the middle spine in the longitudinal direction. The clinical margins used in our hospital are adequate enough for sites H and N, lung, and brain, however, for CSI and pelvis the margins were found to be out of clinical margins. Originally developed as a tool for patient-specific quality assurance in advanced treatment delivery methods to compare between measured and calculated dose distributions, the gamma index (γ) concept was later extended to compare between any two dose distributions. 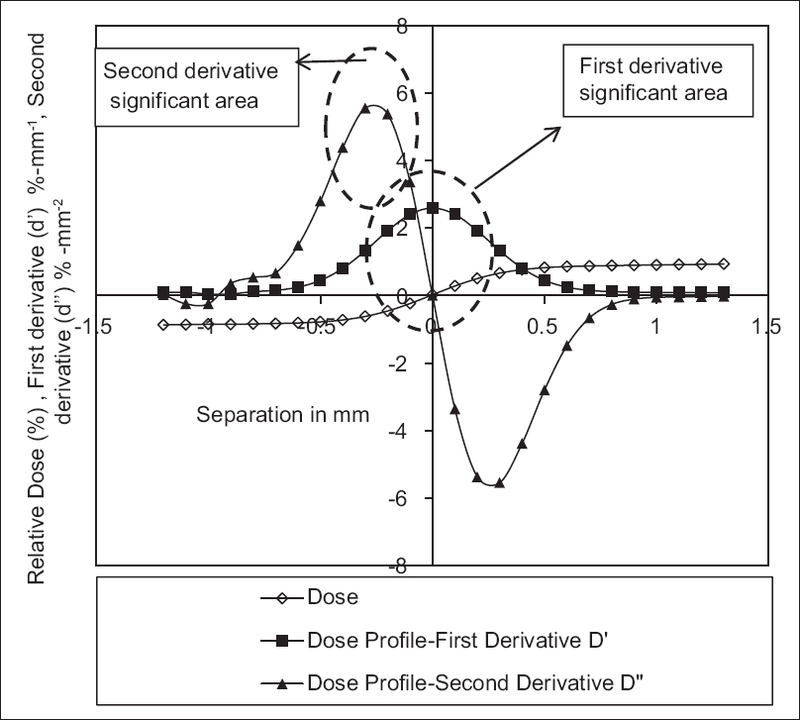 It takes into effect both the dose difference (DD) and distance-to-agreement (DTA) measurements in the comparison. Its strength lies in its capability to give a quantitative value for the analysis, unlike other methods. For every point on the reference curve, if there is at least one point in the evaluated curve that satisfies the pass criteria (e.g., δDD = 1%, δDTA = 1 mm), the point is included in the quantitative score as "pass." Gamma analysis does not account for the gradient of the evaluated curve - it looks at only the minimum gamma value, and if it is <1, then the point passes, no matter what the gradient of evaluated curve is. In this work, an attempt has been made to present a derivative-based method for the identification of dose gradient. A mathematically derived reference profile (RP) representing the penumbral region of 6 MV 10 cm × 10 cm field was generated from an error function. A general test profile (GTP) was created from this RP by introducing 1 mm distance error and 1% dose error at each point. This was considered as the first of the two evaluated curves. By its nature, this curve is a smooth curve and would satisfy the pass criteria for all points in it. The second evaluated profile was generated as a sawtooth test profile (STTP) which again would satisfy the pass criteria for every point on the RP. However, being a sawtooth curve, it is not a smooth one and would be obviously poor when compared with the smooth profile. Considering the smooth GTP as an acceptable profile when it passed the gamma pass criteria (1% DD and 1 mm DTA) against the RP, the first and second order derivatives of the DDs (δD', δD") between these two curves were derived and used as the boundary values for evaluating the STTP against the RP. Even though the STTP passed the simple gamma pass criteria, it was found failing at many locations when the derivatives were used as the boundary values. The proposed derivative-based method can identify a noisy curve and can prove to be a useful tool for improving the sensitivity of the gamma index.